Lothar was created by “Mandrake”‘s creator, Lee Falk, and first appeared in 1934. Some sources I found claim Lothar is the first recurring Black character in a newspaper comic strip, as well as the first somewhat-seriously-treated Black character (versus the often-grotesque stereotypes found in cartoons of the era). “Mandrake” features the adventures of the eponymous magician. His powers mainly consist of creating illusions based on hypnosis, as well as a limited number of other abilities. When not performing as a stage magician, Mandrake has adventures around the world, fighting various menaces. Lothar appeared in the strip’s first storyline, and was initially created as a valet/sidekick of Mandrake. Lothar’s an African prince of a sizable coalition of jungle nations; he opted to leave his homeland to adventure alongside Mandrake. Lothar was initially portrayed with some of the usual Black stereotypes of the era—he spoke broken English and wore a fez and leopard-spot-patterned leotard, a la old-time circus strongmen. The circus strongman image might’ve tied into Lothar possessing superhuman strength. The comic proclaims him as the world’s strongest man, save Mandrake’s chef Hojo (the secret head of a crime-fighting organization). Lothar soon became one of the main supporting characters of the strip; he nearly always appears in “Mandrake”-related spin-off media. Lothar’s biggest change as a character came in 1965, when Fred Fredericks took over the strip as the artist (and the writer after Falk’s death in 1999). Fredericks remained on “Mandrake” until retiring in July 2013, which ended the strip’s lengthy run. Fredericks and Falk modernized the strip, and especially Lothar. He spoke proper English, and lost his leotard in favor of normal clothes. (He does enjoy wearing leopard-skin patterned shirts). Lothar also became a close friend to Mandrake rather than just a servant, and developed his own ongoing storylines/related characters. 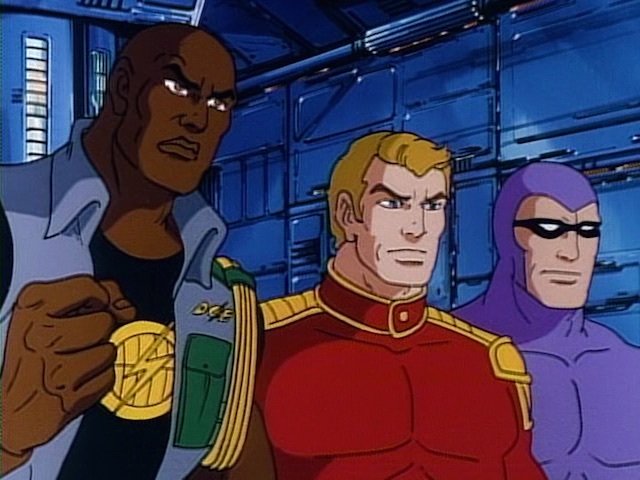 Lothar’s main non-comics appearance to date is in the mid-80s animated series “Defenders of the Earth.” The series focused on Lothar and Mandrake teaming up with fellow comic syndicate heroes Flash Gordon and the Phantom to fight old Flash villain Ming the Merciless. For some reason, the series was set in the then-far-off year of 2015 (30 years in the future). On “Defenders,” Lothar retained his massive strength, and also was shown with tactical/strategic skills. He also has a son named LJ.